I have not been good about keeping up with the blog over the past few weeks, but I haven't been idle. In fact, I've done a lot of small bits of work that all add up to serious progress, but it's tough to know where to start. I guess the best place is where I left off last time with the forward section; I had begun to put in the deck beams at that point and had finished up the structural pieces for the mast step and partners. I continued on with more deck beams and settled on a hatch configuration (rectangular 250 x 380 mm). Epoxying them in place proved to be a bit of a challenge because there wasn't a lot to clamp to so it took a bit of creativity to get it all done. As I progress further into the build, I'm amazed at how the little stuff really slows you down (especially when there is epoxy involved that has a cure time). It seems like the net change of the boat is much smaller than at the start, but that's what everyone tells you; I just didn't want to listen. Anyway, once I had all the deck beams in place I put three coats of white rustoleum paint in the forward area that would be soon be covered by a deck and only accessible by a hatch. I also did three coats in the cubby areas adjacent to the mast step that would also only have access via deck plates. The paint took a considerable amount of time to dry because the temps were cool, so it ended up taking many more days than I had hoped. Once the third coat was mostly dry, I started fitting out the deck. 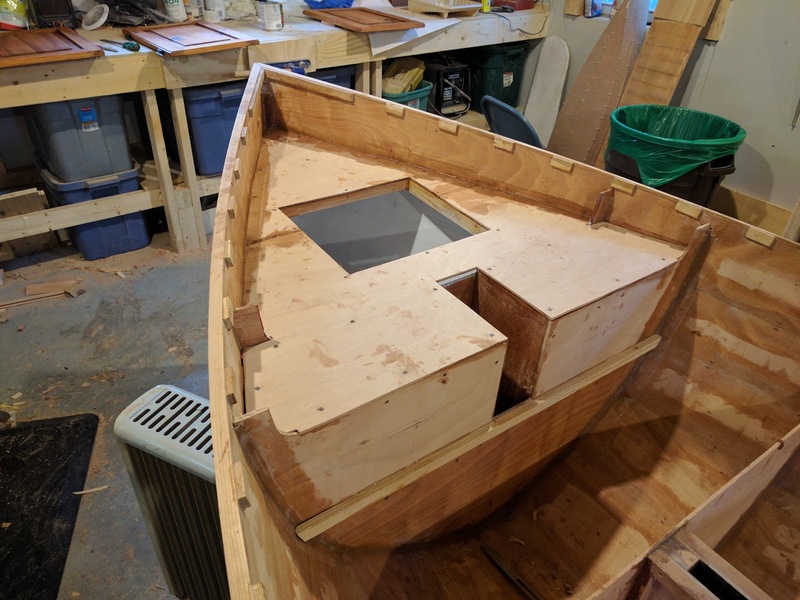 I used the same 6mm plywood for the deck and once I had it fitted nicely (I used 2 pieces to span the area), I buttered everything up with epoxy and screwed it in place with #8 3/4" SS screws. 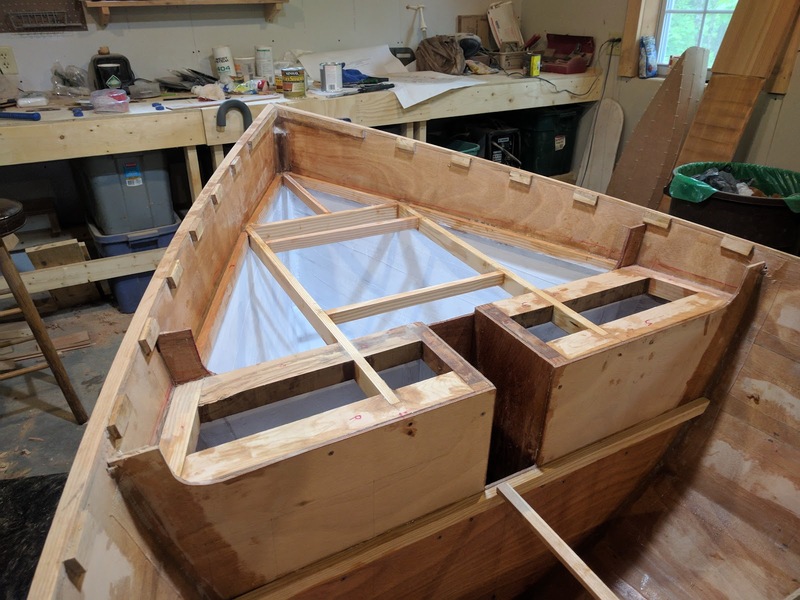 Once that set up, I ran a thick filet down each side of the hull and covered with 75 mm tape to really tie it into the hull. I will eventually sheath the whole deck in 6oz cloth just to provide a little more strength and abrasion resistance, but I'm calling it good for now.